Allow your children to learn about geometry, design, spatial reasoning and construction while they are busy having fun. 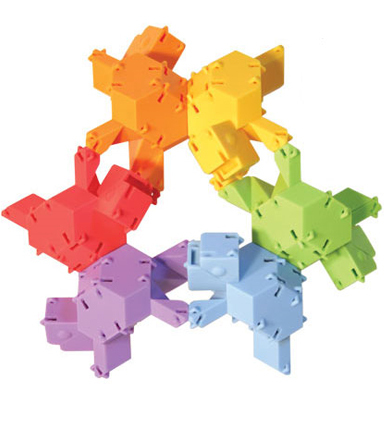 This innovative building toy features 24 pieces that are shaped like turtles. 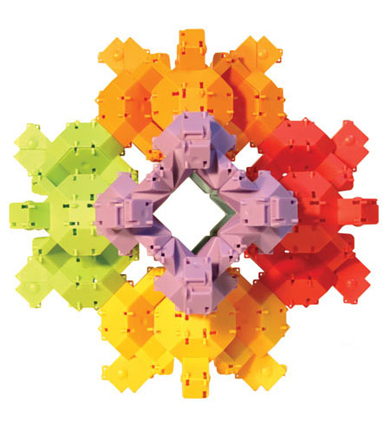 They snap and slide together in over 100 different ways to create all sorts of configurations. Because these aren't just plain old plastic bricks, children are immediately interested in them. Once they start snapping them together their creativity and imaginations will take over as they overlook the fact that they are learning as they explore and create with this remarkable set. Younger children will love to pile them high, while older children will discover all of the geometric shapes, and endless designs that can be created. A bonus activity book is included that will guide children through 80 different puzzles to encourage their young minds to explore the wide world of geometry and construction. Have you ever built a rhombicuboctahedron? Well with this great set you can now. These high quality turtles interlock in a truly unique way to create complex and colorful structures. They are easy to use, but offer a challenge to more experienced builders at the same time. This is the type of building toy that will grow along with children because it is equally appealing to younger children, teenagers and even adults. 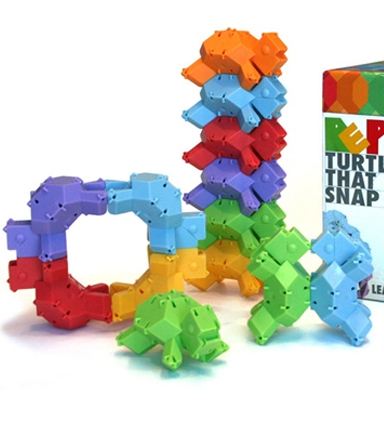 Each little plastic turtle is able to flip, slide, turn, connect, combine and stack to build amazing shapes and structures. Children can use this set over and over again without ever building the same thing twice. The geometry of the polyhedra shape is an essential component to the appeal and application of Reptangles. This shape is key to the countless ways the turtles can be combined. Children quickly advance their skills by building simple to complex polyhedra, the geometrical configuration which inspired their design. Truncated octahedrons never looked so good! Dive into symmetry, reflections and rotations with the accompanying full-color Exploration Guide. An included twenty-page book features step-by-step diagrams to create complex and beautiful structures which will spark the curiosity of even the most seasoned building toy veteran. This set even comes packaged in its own durable storage box. Thousands of play possibilities will evoke innovation & curiosity in any child. 6 and up. 24 pieces. Order Yours Today! Dimensions (l x w) 1.75" x 2.75"
Reptangles Building Toy - Discover hours of stacking and building fun. Your kids won't want to put them down. 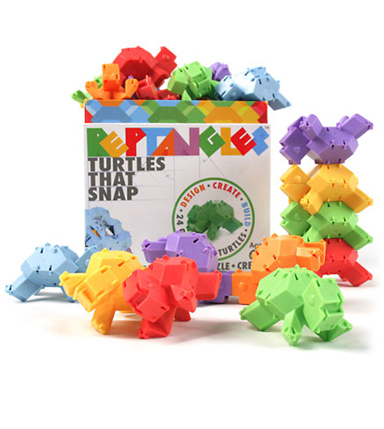 Reptangles teach kids about geometry, design and construction while they are busy having fun. Order Yours Today!